Isn't that pretty much the way that it always used to occur? Rarely did the lyrics have much to do with the content of the video and vice versa. By the way, does anyone else miss music videos besides me? I used to enjoy watching VH1 and MTV (before it jumped the shark) to see and hear the latest music videos. Being able to see a bunch of great gear was a real fun thing, I always thought. In late 1981, I tried to explain MTV to my boss at our Holiday Party. But, do you miss being able to see the music videos on MTV and VH-1, Twangmeisternyc? For me, it was a learning tool about guitars and amps and the like. Perhaps the recording industry is too de-centralized with the proliferation of home recording studios and the independent marketing of recordings to have music videos and television stations devoted to music videos. Where would they begin to start in terms of what bands' videos to air? For those first 5 years or so, it was a fun time as it was new and Music Artists and Film combined in a unique way. Then it became a back-breaker to compete, and expenses went crazy hoping your video would get airplay. I suppose that you are right, Proteus, in that YouTube has now taken the place of what MTV and VH-1 used to offer us. Lord knows, I can kill countless hours watchingvideos there, but so many more of them now are concert videos, Which one could argue is even better in its own way. Absolutely correct. Instagram and YouTube have replaced the MTV and VH1 era. The costs and time to make a video for a single have been, for the most part, replaced by instantly gratifying posts on IG, Facebook, and Twitter. Social media wants it now, the download and music streaming sites have changed the business game forever. It’s a different world out there, folks. Try to keep up. Heaven knows, I am. The best thing about MTV/VH1 was the fact that if you had a good video, you would get airplay, even if you were unknown. Lots of one hit wonders came from those videos, in the 80's. And lots of good tunes, and of course some bad, for the same reason. I do miss it though. I hate reality TV and thank you MTV for that. More than the white socks, black loafers, black fedora, or leather jacket, perhaps the most iconic piece of Michael Jackson’s wardrobe first appeared during his performance on the 1983 television broadcast of the Motown 25th Anniversary Special where he sang “Billie Jean.” That was the broadcast where the “King of Pop” absolutely electrified the audience with the first performance of his famous “moonwalk” and had the audience on their feet for the entire performance. Reportedly, the sequined white glove which he wore on his left hand that night was first thought of the day of the performance and had to be hurriedly stitched together. The actress, Cicely Tyson, who was a friend of Jackson’s, however, has since claimed that it was to cover up the visible effects of vitiligo, a disease that causes blotches of whitening skin. Whatever the reason, the “Gloved One”, as he eventually came to be known by to some, adopted the one glove look as a trademark. When asked why he didn’t wear two gloves, he responded that it was “cooler” to wear just one glove. Here is the glove which Jackson wore during the “Dangerous” tour in 1992. Careful observers will note that this right-handed glove is not the same glove that he wore on the 25th Motown Anniversary on his left hand. That glove was given to Walter “Clyde” Orange, founding member of The Commodores, after the Motown performance. The Commodores had toured as the opening act for the Jackson 5 in the summer of 1971, and they were on the Motown show as well. In 2009, the original glove was auctioned by Julien’s Auctions. The original estimate was that the glove would fetch $40,000 to $60,000. However, it actually sold for $350,000. Many have believed that the original estimate of the glove’s value was underestimated so as to stimulate interest in it. Watch Michael Jackson’s historic performance on the 25th Motown Anniversary television special. From the first moment that I heard the strains of I Want To Hold Your Hand wafting across the school playground in about the fifth grade, I was absolutely slayed – and still am – by the whole package that the band presented, whether the rhythmic playing of Lennon, the interesting fills and tone of George Harrison’s guitar, or the tremendous vocals of Lennon and Paul McCartney. This was truly a case of the whole being vastly greater than the sum of their parts, albeit as tremendous as those individual talents were. Without ÜTube and the internet in those days, it wasn’t quite so easy to find out what bands looked like. Or, even more importantly, what their guitars looked like. 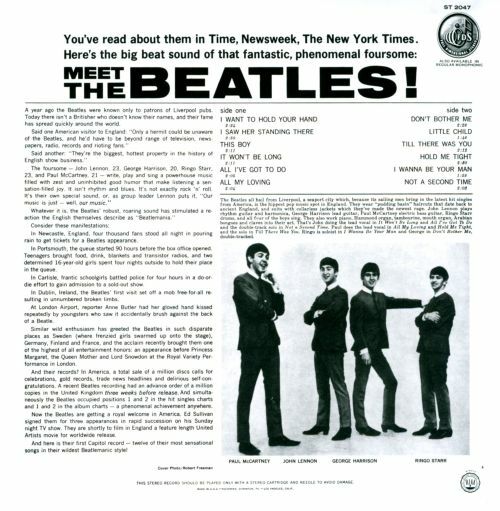 My first visual impression of the Beatles was from their first US released album, Meet The Beatles. My childhood pal who lived across the street had the album and we used to put it on his mother’s hi-fi phonograph and sing along with it at every chance that we could. While the front cover of the album had the iconic partially lit faces against the black background, it was the photo on the rear cover of that album seemed to really resonate with me somehow. It was a photograph which depicted the band members wearing their grey, three-button, collarless-jacket suits standing somewhat playfully in a row. Collarless jackets? I had never heard of that before. The only suits that I had seen were those in church which were varying shades of bland to boring. But, here were suit jackets without collars. And they looked absolutely cool. Before the band acquired these collarless suits, their manager Brian Epstein had fretted that they needed to leave behind their rocker look (black leather jackets, blue jeans, and pompadour hairstyles) for a more refined appearance that would appeal to a wider audience. Epstein commissioned the creation of these collarless jacket suits by the Beatles’ tailor, Doug Millings, which had apparently been inspired by similar suits created by Pierre Cardin in 1960. 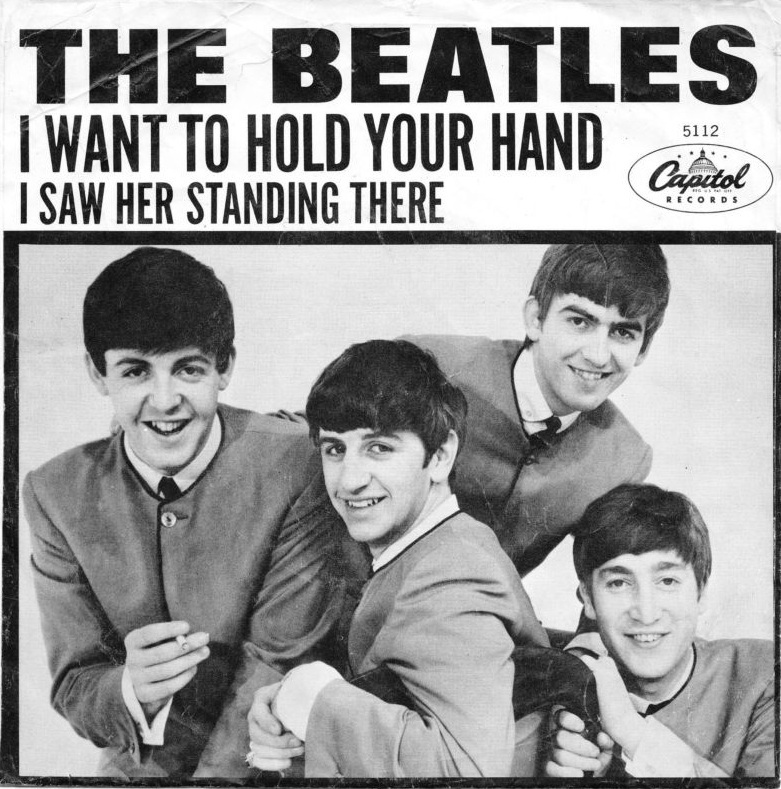 The band wore the suits onstage in England and Scandanavia in the fall of 1963 and they could be seen on the sleeve of the U.S. single I Want To Hold Your Hand, as well as on the Meet The Beatles back album cover. So, what became of those suits? Amazingly, here is Paul McCartney’s entire suit in absolutely tremendous condition. And then John Lennon’s collarless jacket, which had been in the possession of a Beatles memorabilia collector who sold it to Yoko Ono in 2006. And finally, Ringo’s jacket. What are the odds of all three of these jackets having been located in such fine condition? And what became of George Harrison’s suit or jacket, you ask? That is a good question for which I have no good answer. Do you know? Now, to see these suits in action, you can view the Beatles in a performance video from 1963 of the song, "She Loves You." I wondered at the time why john's had the weird beige buttons. That is so true -- very odd. Perhaps simply the non-conformist in him. Good catch, JB! As I’m sure you’re aware (but for them what maybe ain’t), the aforementioned tailor played himself in “Hard Day’s Night” in the scene where John “declared this bridge...[snip]...open” and sliced through his tape measure. I love that scene! Ha! Sammy, I wasn't aware that that was Doug Millings in that scene. Another installment from this past summer’s visit to the Rock ‘n’ Roll Hall of Fame. Let’s get to the creme de la creme of all of the Hall’s exhibits – the John Lennon 1958 Rickenbacker 325 Capri guitar. John Lennon bought this Rickenbacker 325 in 1960 following the Beatles’ first trip to Hamburg after he had seen a record cover of “Toots” Thielemans playing a Rickenbacker. The guitar originally had a natural finish with a gold pickguard and Kaufmann vibrato. Later that same year, Lennon changed the vibrato to a Bigsby B-5, installed a “bowtie” bridge and replaced the classic “TV”-style knobs for new ones. Here is John Lennon's 325 back in 1958 when it was on display at the Rickenbacker exhibit at a NAMM Show. It is the natural-finished guitar just to the left of Thielemans's right elbow. A closeup of the guitar's three "toaster"-style pickups and bowtie bridge. Two years later, Lennon had the guitar painted black, which is the manner in which most Americans first saw the guitar. He also had the middle pickup disconnected. The guitar was retired in 1964 after being used to record the LP “Beatles for Sale.” In 1972, Lennon had the guitar restored to its natural finish which is how it appears today in the Hall of Fame. This guitar, due to its provenance as John Lennon’s main guitar for many years, along with its having been seen by 73 million fans watching the Ed Sullivan Show on February 9, 1964, makes this one of the most valuable guitars ever to have existed. Note that this guitar has a white scratchplate, but it was gold at the time of the Sullivan broadcast, as depicted in some of the photos in this post. It should not be confused with the 1964 “Miami” 325 guitar presented to Lennon at the time of the Sullivan broadcast from the Deauville Hotel in Miami which bore a white pickguard and the standard “tiered” white scratchplate. When I visited the Hall, the guitar was in a display case showing artifacts from the Ed Sullivan Show. Lennon’s “Miami” Rickenbacker 325 was the one residing in the main Beatles display case. More on that guitar some other time. This guitar, along with the “Miami” Rickenbacker 325, was perhaps the most impressive rock music artifact that I saw while at the Hall. It brought back so many memories from having first seen it on the Sullivan Show, to having seen and watched countless photographs and videos of the band in which the guitar was used. To see it just behind the glass was pretty much mind-blowing for me. To see this guitar being played by John Lennon on the first Ed Sullivan Show broadcast from February 9, 1964, click this link HERE. Here is the guitar in its original condition before Lennon had the guitar painted black. Note the Kaufmann Vibrola and the original TV-style knobs.